Like Mozart, Mendelssohn was regarded as one of the finest pianists of his day but also maintained a life-long interest in the organ. In the same year as his first composition for piano (1820) came his first for organ, a sombre, slow-moving chordal Prelude in D minor. While he continued to learn the piano, and acquire early a formidably versatile technique under Ludwig Berger, his chief musical mentor, Carl Zelter, covered wider ground to include two of the formative influences on Mendelssohn’s later writing for the organ—a study of J S Bach and, from its first publication in 1821, the Choralbuch of Michael Gotthardt Fischer (1773–1829). Mendelssohn wrote a conservative set of variations on one of the tunes in this book, and Fischer’s own organ works, too, form a vital ingredient in the development of writing for the instrument in a new, flexible and dramatic yet idiomatic way. He was organist at Erfurt (also a Bach connection) and his virtuoso writing for both pedals and manuals is a hitherto underestimated force in the development of organ-writing in the early Romantic period. A W Bach (only a distant relation to the great Bach family) was another leading organist, and also composer, who directly influenced the young Mendelssohn, this time through a course of formal instruction. It should be remembered that by 1800 the organ on the mainland of Europe had sunk to perhaps the lowest level of interest and involvement in the general musical scene in its long and distinguished history. The almost continuous military, social, and political upheavals of the second half of the eighteenth century culminated in the French Revolution and the Napoleonic wars, the consequences of which reached deep and wide into the fabric of Church and State. Even as late as 1823, Mendelssohn wrote vividly of a visit to Breslau: ‘Then he showed me the inside of the organ itself. Shot and shell have struck many pipes so they are useless.’ From other sources we know that this was not an isolated case. Many formerly notable instruments had large segments which had lapsed into disrepair, and much war damage had remained untended. Another contributory factor to the organ’s isolation was its inability to follow stylistic developments as quickly as they occurred in the mainstream of musical activity. Until the inventiveness of the Industrial Revolution in the early-nineteenth century provided the mechanical means, the organ remained intractible to the demands of flexible dynamics and a rapidly eliding spectrum of colour. Nonetheless, Mendelssohn continued to compose for the organ and the most notable of these early compositions are a soft Andante (9 May 1823), entirely characteristic in manner, and, from three months later, the variations on a chorale from Fischer’s book. But it was the first of eventually ten visits to England (in 1829) which fused together a number of elements that were to form a lasting influence on Mendelssohn’s development as an organist and composer for the instrument. Fresh from his own revival of the St Matthew Passion earlier that year, he found an active Bach lobby in London led by Samuel Wesley, and an equally active native school of organ playing and composition enriched by a living use of counterpoint fostered by England’s stylistic isolation and the continuing influence of Handel. In Wesley’s large-scale voluntaries in several movements, often starkly contrasted in mood, we can see the formal seeds of Mendelssohn’s Opus 65 Sonatas; certainly he knew at least one of them which Wesley had dedicated (in 1829) to Thomas Attwood, pupil of Mozart, Composer to the Chapel Royal and, from 1796, organist of St Paul’s Cathedral. It was at Attwood’s house in Norwood that Mendelssohn stayed for over two months recovering from a carriage accident in September 1829, and their friendship was to last until the former’s death nine years later. The accident also prevented Mendelssohn from attending his sister Fanny’s wedding in Berlin on 3 October, though he wrote her an organ piece of which we shall hear more later. Returning home in December, it was scarcely six months before, at Goethe’s suggestion, he set out again—for Italy. The letters from this journey are particularly illuminating of both vocal and instrumental performance practice and, despite Mendelssohn’s tart comments on the tawdry fare served up by Italian organists, he wrote in Rome on 8 March 1831 a Nachspiel (or Prelude and Fugue) in D, ideas from which he was to use again, and on his return journey through Switzerland that August, at Engelberg he noted: ‘I played two new pieces of mine on the organ this afternoon in the church, and they sounded rather good.’ In an important letter (24 August 1831) he describes his accompaniment of a Mass and an improvisation on the Credo: ‘A fantasia on that went rather well; for the first time, I wanted to write such a thing down.’ He details the progress of the piece: ‘… and then in long notes with the continuing arpeggios I brought out the theme on the pedals so that it finished on A. Over this sustained pedal-point I played more arpeggios, also with left hand alone in order to begin the Credo theme in the right hand above.’ His manuscript example confirms that here was, in embryo, the brilliant texture he employed, fourteen years later, at the end of the chorale variations which form the opening of the D minor Sonata, Opus 65 No 6. Mendelssohn now entered a period of intense contrapuntal creativity, culminating in the publication of Six Preludes and Fugues, Op 35, for piano (into which went a revision of the D major duet for Attwood) and, for issue by both Novello and Breitkopf & Härtel in the spring of 1837, the Three Preludes and Fugues, Op 37, for organ, dedicated to Attwood. At the end of 1836 Mendelssohn revised the C minor Fugue and wrote on 1 December a new one in G, reflecting certain technical details, for example the opening on the pedals, and the long dominant and tonic pedal-points, from the Rome Nachspiel; between 2 and 6 April 1837 he wrote the three Preludes and revised Novello’s D minor Fugue of 1833 to complete the set. Their masterly fusion of old and new styles was of immense influence on the development of nineteenth-century organ music. The first Prelude recasts in organ terms the contrapuntally active passagework clothed in Romantic harmony found in many early works (the fine but little-known Trumpet Overture for example); the second continues the expansive lyricism of the first Fugue, a style much to be imitated in later English organ music; the third Prelude sets passagework of pianistic virtuosity against a recurring fugal section—a device which was to be developed in the Organ Sonatas, Op 65. In September 1837 Mendelssohn directed St Paul in Birmingham Town Hall, where he also played Bach’s ‘St Anne’ Prelude and Fugue; he played again at St Paul’s Cathedral and, two days later, performed ‘six extempore fantasias’ and Bach’s great A minor Fugue on the new organ at Christ Church, Newgate Street: ‘His extempore playing is very diversified—the soft movements full of tenderness and expression, exquisitely beautiful and impassioned—and yet so regular and methodical that they appear the production of long thought and meditation … in his loud preludes there are an endless variety of new ideas totally different from those usually in vogue; and the pedal passages so novel and independent, so solemn and impressive, so grand and dignified, as to take his auditor by surprise.’ He played again on each of his visits in 1840 and 1842, and on 25 July 1844 he wrote to his sister: ‘Look out the A major organ piece I composed for your wedding … I have promised an English publisher [Coventry and Hollier] a whole book of organ pieces and as I am writing them out one after another, that old one suddenly occurred to me. I love the beginning, but detest the middle, and am completely rewriting it with another chorale fugue, on Aus tiefer Noth.’ Fanny’s manuscript was not forthcoming so he completed from memory what was to become the first movement of Opus 65 No 3. On holiday at Soden near Frankfurt in 1844, Mendelssohn wrote seven organ pieces between 21 July and 18 August; he then conducted the Zweibrücken Festival and told Coventry on 29 August that he had ‘been very busy about the organ pieces … and they are nearly finished. I should like to call them Three Sonatas … instead of Voluntaries.’ He resumed work on 9 and 10 September with three more pieces and the revision of an F minor Fugue (which, together with two others, in E minor and C, he had written in 1839) and—amazingly—the next six days saw the completion of the E minor Violin Concerto. At this point Mendelssohn clearly envisaged three organ sonatas in F, D, and A, but other commitments interrupted work until 19 December. By 2 January he had expanded the project by composing two more sequences of pieces, in B flat and C, though none of the by-now five sonatas had reached their definitive form. On 26/7 January 1845 he composed the whole of what was to become Sonata No 6 in D minor and set about painstakingly sifting, revising, and rejecting the rest of the material. The Sonata No 1 in F minor (originally Nos 1 and 3 were in reverse order) opens with one of the strongest movements in the whole group, in which the chorale Was mein Gott will gescheh’ allzeit is set in stark contrast against a predominantly fugal movement. 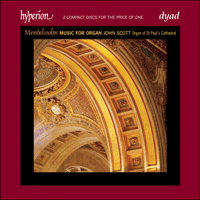 After a lyrical Song without words the contrast, this time between quiet questions in recitative and full organ answers, is revived before the final toccata. Mendelssohn ultimately rejected the 1839 F minor Fugue, and also the Andante in F major of 21 July 1844, a gentle trio, which are included here separately. Only the opening two movements of Sonata No 2 in C minor were new (the Adagio having a particularly subtle texture); the third reworks the opening of the 1831 Nachspiel, and the last is a revision of another of the 1839 fugues. Of the two further C major movements not used, the march-like Allegro maestoso in C major is included here separately. To complete the Sonata No 3 in A major, Mendelssohn added only a short, ruminatively tuneful movement—a revision of the wedding piece from 1829. Sonata No 4 in B flat major caused the composer much trouble, both the expansive prelude and Andante (the latter originally a march) being rewritten; the energetic and tuneful Allegro in B flat major was composed first but rejected in favour of a fugue on a similar subject to the present finale. This itself was revised (to make the subject more idiomatic to the pedals) and enclosed within its chordal introduction and coda at the same time as the flowing Allegretto was added. Out of the various movements in D from which Mendelssohn could have compiled Sonata No 5 in D major and Sonata No 6 in D minor, he rejected two which are recorded here. In the Andante in D major a simple theme is followed by four variations of poise and charm, a complete contrast to the powerful Allegro, Chorale and Fugue in D major written two days later. Sonata No 5 had originally a variant of the opening chorale (probably Mendelssohn’s own, but similar to Dir, dir Jehovah, will ich singen) before the finale (then with semiquaver figuration rather than triplets and with many changes of manual), while the lilting second movement was in D (rather than B) minor; unusually with Mendelssohn, it is debatable which is the superior form. Sonata No 6 is permeated by the chorale Vater unser im Himmelreich; it opens with four successively more brilliant variations on it; the succeeding fugue takes the opening phrase for its subject, and in the valedictory finale, the last phrase is found in the pedals. The Sonatas were published on 15 September 1845 and although Mendelssohn only performed them in private, he witnessed the public success of No 3 in London in 1847. He himself, shattered by both the strain of composing, performing, and revising Elijah, and by the death of his sister, played the organ for the last time that summer at Ringgenberg near Interlaken, improvising a prelude and fugue in C minor. He died the following November, aged thirty-eight. Comme Mozart, Mendelssohn s’interessa à l’orgue pendant toute sa vie bien qu’estimé être l’un des meilleurs pianistes de son époque. Il écrivit sa première composition pour piano en 1820 et sa première composition pour orgue un peu plus tard cette même année; un Prélude ténébreux en accords lents en ré mineur. Alors qu’il continuait à étudier le piano et acquérait très tôt une technique très variée sous la tutelle de Ludwig Berger, Carl Zelter, son principal mentor dans le domaine musical, lui faisait couvrir un terrain plus vaste qui devait inclure deux influences formatrices sur les compositions pour orgue plus tardives de Mendelssohn—une étude de J S Bach et, dès sa première édition en 1821, le Choralbuch de Michael Gotthardt Fischer (1773–1829). Mendelssohn écrivit une série classique de variations sur l’un des airs de ce livret et les propres œuvres pour orgue de Fischer sont aussi un élément vital du développement de l’écriture pour cet instrument dans un style nouveau, flexible et dramatique tout en étant idiomatique. Il était organiste à Erfurt (qui a aussi un rapport avec Bach) et ses compositions destinées aux virtuoses des pédales autant que du clavier ont été une force jusqu’ici sous-estimée dans le développement de l’écriture pour orgue au début de la période romantique. A W Bach (un parent éloigné seulement de la célèbre famille Bach) était un autre grand organiste et compositeur qui influença directement le jeune Mendelssohn, mais cette fois-ci par un programme d’instruction formelle. Il ne faut pas oublier que dès 1800, l’orgue avait sombré au niveau le plus bas de sa longue histoire distinguée sur la scène musicale générale d’Europe continentale en termes d’intérêt suscité et de participation active. Les commotions militaires, sociales et politiques presque continuelles durant la dernière moitié du dix-huitième siècle aboutirent à la révolution française et aux guerres napoléoniennes dont les répercussions atteignirent profondément et de façon très étendue la fabrique de l’église et de l’état. Aussi tard qu’en 1823, Mendelssohn décrivait très nettement par écrit une visite à Breslau: «Puis il me montra l’intérieur de l’orgue même. Balles et obus avaient touché de nombreux tuyaux rendus ainsi inutilisables.» Nous savons d’après d’autres sources qu’il ne s’agissait pas d’un cas isolé. De nombreux anciens instruments remarquables étaient en grande partie tombés en mauvais état et un grand nombre des dégâts de guerre étaient restés sans soins. Un autre facteur contributif de l’isolement de l’orgue était son incapacité à suivre les développements stylistiques aussi vite qu’ils apparaissaient au sein du courant principal de l’activité musicale. Il fut impossible de soumettre l’orgue aux exigences de la dynamique flexible et d’un spectre de couleurs qui s’élidait rapidement avant que l’esprit inventif de la révolution industrielle au début du dix-neuvième siècle n’en fournisse les moyens mécaniques. Néanmoins Mendelssohn continua à composer pour l’orgue et les plus remar­quables de ces compositions précoces sont les doux Andante (9 mai 1823), dans une manière tout à fait caractéristique, et, à partir de trois mois plus tard, les variations sur une chorale du livret de Fischer. Mais ce fut la première d’en définitive dix visites en Angleterre (en 1829) qui réunit plusieurs éléments qui devaient avoir une influence durable sur le développement de Mendelssohn comme organiste et compositeur de musique d’orgue. Tout juste après avoir repris la Passion selon Saint Mathieu un peu plus tôt cette même année, il trouva à Londres un cercle actif d’enthousiastes de Bach sous la direction de Samuel Wesley, une école locale tout aussi active d’orgue et de composition pour orgue enrichie par un emploi vivant du contrepoint protégé par l’isolement stylistique de l’Angleterre et l’influence soutenue de Haendel. Dans plusieurs mouvements des morceaux d’orgue à grande échelle de Wesley, souvent d’humeur fortement contrastée, on reconnaît la graine formelle des sonates de Mendelssohn Opus 65; il connaissait certainement au moins l’un de ces morceaux que Wesley avait dédié (en 1829) à Thomas Attwood, élève de Mozart, compositeur de la Chapelle Royale et à partir de 1796, organiste de la cathédrale Saint Paul. C’est à Norwood chez Attwood que Mendelssohn séjourna pendant plus de deux moins alors qu’il se remettait d’un accident de voiture survenu en septembre 1829 et leur amitié devait durer jusqu’à la mort d’Attwood neuf ans plus tard. Cet accident empêcha également Mendelssohn d’assister au mariage de sa sœur Fanny à Berlin le 3 octobre mais il écrivit pour elle une œuvre pour orgue dont nous reparlerons plus tard. Rentré chez lui en décembre il ne s’était pas passé six mois avant que, sur la suggestion de Goethe il ne reparte, cette fois-ci pour l’Italie. Les lettres de son voyage sont particulièrement révélatrices sur les habitudes de l’époque en matière d’exécution vocale et instrumentale et malgré les commentaires caustiques de Mendelssohn sur les récitals de mauvais goût des organistes italiens, le 8 mars 1831 il composait à Rome un Nachspiel (ou prélude et fugue) en ré, dont il devait reprendre plus tard les idées et pendant son voyange de retour à travers la Suisse en août, il notait à Engelberg: «J’ai joué deux de mes nouveaux morceaux pour orgue à l’église cette après-midi et ils ne m’ont pas semblé trop mauvais du tout.» Dans une lettre importante (du 24 août 1831) il décrit son accompagnement d’une messe et une improvisation sur le credo: «Une fantaisie là-dessus assez réussie; pour la première fois j’ai voulu écrire un tel morceau.» Il décrit les progrès de l’œuvre: «… puis en notes longues en continuant les arpèges, j’ai utilisé les pédales pour faire ressortir le thème et pour qu’il finisse en la. Sur ce point d’orgue soutenu j’ai encore joué des arpèges, également de la main gauche seule pour pouvoir commencer le thème du credo de la main droite dans un registre plus élevé.» L’exemplaire de son manuscrit confirme que c’était en germe, la texture brillante qu’il devait employer quatorze ans plus tard, à la fin des variations pour chorale qui forment l’ouverture de la sonate en ré mineur op.65 no6. Mendelssohn commença alors une période d’intense créativité en contrepoint qui devait se terminer par la publication des six Préludes et Fugues op.35 pour piano (auxquelles fut incorporée une révision du duo en ré majeur pour Attwood) et celle des trois Préludes et Fugues op.37 pour orgue dédiées à Attwood qui devaient être éditées par Novello et Breitkopf & Härtel au printemps 1837. Fin 1836, Mendelssohn révisa la Fugue en ut mineur et le 1er décembre en composait une nouvelle en sol qui reflètait certains détails techniques, par exemple l’ouverture sur les pédales, les longs points d’orgue toniques dominants, du Nachspiel de Rome; entre le 2 et le 6 avril 1837 il composa les trois Préludes et révisa la Fugue en ré mineur de Novello de 1833 pour compléter la série. Cette fusion magistrale du style ancien et nouveau eut une influence énorme sur le développement de la musique d’orgue du dix-neuvième siècle; le premier Prélude remodèle pour l’orgue le passage actif en contrepoint tapissé d’harmonie romantique que l’on trouve dans de nombreuses compositions plus anciennes (l’Ouverture pour trompette, par exemple, belle mais peu connue); le deuxième poursuit le lyrisme expansif de la première Fugue—un style qui devait être très imité dans la musique d’orgue anglaise plus récente; tandis que le troisième Prélude place un passage d’une virtuosité pianistique contre une section fuguée récursive—un moyen qui devait être développé dans les Sonates pour orgue op.65. En septembre 1837 Mendelssohn dirigeait St Paul à l’hôtel de ville de Birmingham où il joua aussi le Prélude et Fugue «St Anne» de Bach; il rejoua à la cathédrale Saint Paul et deux jours plus tard jouait les «six fantaisies impromptues» et la grande Fugue en la mineur de Bach sur le nouvel orgue de Christ Church dans Newgate Street: «Son exécution des impromptus est très diversifiée—les mouvements doux pleins de tendresse et d’expression, d’une beauté exquise et remplis d’exaltation—et pourtant si réguliers et méthodiques qu’ils semblent être le fruit d’une longue réflexion et méditation … dans ses préludes bruyants, on trouve une variété infinie d’idées nouvelles complètement différentes de celles généralement en vogue; et les passages de pédale sont si neufs et si indépendants, si solennels et si impressionnants, si majesteux et si dignes, qu’ils surprennent son auditeur.» Il joua de nouveau à chacune de ses visites en 1840 et 1842 et le 25 juillet 1844 il écrivait à sa sœur: «Recherche le morceau d’orgue en la majeur que j’ai composé pour votre mariage … j’ai promis à un éditeur anglais [Coventry and Hollier] tout un livret de morceaux pour orgue et je suis en train de les composer l’un après l’autre, je viens de me souvenir de cet ancien morceau-là. J’adore le commencement mais déteste le milieu et je suis en train de le ré-écrire complètement avec une autre fugue pour chorale, sur Aus tiefer Noth.» Comme Fanny ne lui envoyait pas le manuscrit désiré, il termina de mémoire ce qui devait devenir le premier mouvement de l’op.65 no3. En vacances à Soden près de Francfort en 1844, Mendelssohn écrivit sept œuvres pour orgue entre le 21 juillet et le 18 août; puis il dirigea le festival de Zweibrücken et dit à Coventry le 29 août qu’il avait été «très occupé avec les morceaux d’orgue … et ils sont presque finis. J’aimerais les appeler les Trois Sonates … au lieu de Morceaux d’Orgue d’église». Le 9 et le 10 septembre il se remettait au travail sur trois autres morceaux et la révision d’une Fugue en fa mineur (qu’il avait écrite en 1839 avec deux autres) et—chose incroyable—au cours des six jours suivants il termina le Concerto pour violon en mi mineur. Mendelssohn envisageait clairement à ce moment-là de composer trois Sonates pour orgue en fa, ré et la mais d’autres engagements interrompirent son travail jusqu’au 19 décembre. Dès le 2 janvier il avait agrandi son projet en composant deux séquences supplémentaires aux morceaux, en si bémol et en ut, bien qu’aucune de ces maintenant cinq Sonates n’avait atteint sa forme définitive. Les 26 et 27 janvier 1845 il composait l’ensemble de ce qui devait devenir la Sonate no6 en ré mineur et entreprit la tâche laborieuse de passer au crible, réviser et rejeter le reste de ses manuscrits. La Sonate no1 en fa mineur (à l’origine les sonates nos1 et 3 étaient dans l’ordre inverse), s’ouvre sur l’un des mouvements les plus puissants de tout le groupe, dans lequel la chorale Was mein Gott will gescheh’ allzeit est mise en vif contraste sur un mouvement essentiellement fugué. Après son œuvre lyrique Romance sans paroles, le contraste, cette fois-ci entre les questions tranquilles en récitatif et les réponses au jeu d’orgue complet, est repris avant la toccata finale. Mendelssohn finit par rejeter la Fugue en fa mineur de 1839 ainsi que l’Andante en fa majeur, un gentil trio qui est inclus ici séparément. Seuls les deux mouvements d’ouverture de la Sonate no2 étaient nouveaux (l’adagio ayant une texture particulièrement subtile); le troisième retravaille l’ouverture du Nachspiel de 1831 et le dernier est une révision d’une autre des Fugues de 1839. Des deux autres mouvements en do majeur non utilisés, l’Allegro maestoso qui ressemble à une marche est inclus ici séparément. Pour compléter la Sonate no3 en la, Mendelssohn n’ajouta qu’un mouvement court méditativement harmonieux à la suite de l’œuvre de mariage révisée de 1829. La Sonate no4 en si bémol donna beaucoup de mal au compositeur, le prélude expansif et l’Andante (à l’origine une marche) sont tous les deux ré-écrits; l’Allegro énergique et harmonieux en si bémol fut composé en premier mais rejeté en faveur d’une fugue sur un sujet similaire à celui de la finale actuelle. Cette finale fut elle-même révisée (pour que le sujet convienne mieux aux pédales) et entourée de son introduction en accords et de sa coda au moment où l’allegretto fluide était ajouté. Parmi les divers mouvements en ré majeur et mineur à partir desquels Mendelssohn aurait pu compiler les Sonates nos5 et 6, il en rejeta deux qui sont enregistrés ici. Dans l’Andante avec variations en ré, un thème simple est suivi de quatre variations qui possèdent prestance et charme, un contraste total avec l’Allegro, Chorale et Fugue puissant écrit deux jours plus tard. La Sonate no5 avait à l’origine une variante de la chorale d’ouverture (probablement de Mendelssohn mais qui ressemble à Dir, dir Jehovah, will ich singen) avant la finale (alors avec des embellissements en doubles-croches plutôt que des tercets et avec de nombreux changements au clavier), tandis que le deuxième mouvement scandé était en ré (plutôt qu’en si) mineur; chose rare chez Mendelssohn et savoir quelle est la forme supérieure est discutable. La Sonate no6 est imprégnée de la chorale Vater unser im Himmelreich; elle s’ouvre avec quatre variations successives plus éclatantes l’une que l’autre sur le thème de la sonate; la fugue qui suit reprend la phrase d’ouverture comme sujet et dans la finale d’adieu la dernière phrase est jouée sur les pédales. Les Sonates furent publiées le 15 septembre 1845 et bien que Mendelssohn ne les ait jouées qu’en privé, il assista au succès de la Sonate no3 à Londres en 1847. Ereinté par la fatigue et l’effort de composer, jouer et réviser Elijah et par la mort de sa sœur, il joua l’orgue pour la dernière fois cet été-là à Ringgenberg près d’Interlaken, lorsqu’il improvisa un prélude et une fugue en do mineur. Il mourut au mois de novembre suivant âgé de 38 ans. Obwohl er als einer der glänzendsten Pianisten seiner Zeit angesehen war, brachte Mendelssohn, genau wie Mozart, der Orgel ein lebenslanges Interesse entgegen. Im selben Jahr, kurz nach seiner ersten Komposition für Piano (1820), schrieb er seine erste für die Orgel, ein düsteres, langsames, aus Akkorden bestehendes Präludium in d-Moll. Während er weiterhin das Klavierspielen lernte und unter Ludwig Berger früh eine beeindruckend vielseitige Spieltechnik gewann, behandelte sein wichtigster musikalischer Mentor, Carl Zelter, einen umfangreicheren Stoff, aus dem zwei Elemente einen prägenden Einfluß auf Mendelssohns spätere Kompositionen für die Orgel hatten—eine Studie über J. S. Bach und, von der ersten Herausgabe im Jahre 1821 an, Michael Gotthardt Fischers (1773–1829) Choralbuch. Mendelssohn schrieb eine konservative Serie von Variationen über eine der Melodien in diesem Buch, während Fischers eigene Orgelwerke auch einen entscheidenden Bestandteil in der Entwicklung der Komposition für die Orgel ausmachen, auf eine neue, flexible und dramatische, und doch idiomatische Art. Er war Organist in Erfurt (auch eine Beziehung zu Bach) und seine virtuose Komposition für das Pedal sowie die Manuale ist ein bis jetzt unterschätzter Impuls in der Entwicklung der frühromantischen Orgelkomposition. A. W. Bach (nur ein weitläufiger Verwandter der großen Familie Bach) war ein weiterer führender Organist und Komponist, der einen direkten Einfluß auf den jungen Mendelssohn hatte, in diesem Falle durch einen Kursus von formalem Unterrrichtsstunden. Man darf nicht vergessen, daß um 1800 das Interesse an der Orgel und ihre Beteiligung an der allgemeinen Musikszene auf dem europäischen Festland inzwischen auf den tiefsten Punkt in ihrer namhaften Geschichte gesunken war. Die fast ununterbrochenen militärischen, gesellschaftlichen und politischen Umwälzungen der letzten Hälfte des achtzehnten Jahrhunderts gipfelten in der französichen Revolution und den napoleonischen Kriegen, deren Folgen tief und weit in die Struktur der Kirche und des Staates eindrangen. Noch im Jahre 1823 schrieb Mendelssohn lebhaft von einem Besuch in Breslau: „Dann zeigte er mir das Innere der Orgel selbst. Schrot und Patronen haben viele Pfeifen getroffen, so daß sie unbrauchbar sind.“ Aus anderen Quellen wissen wir, daß dies kein Einzelfall war. Große Teilstücke von vielen ehemals angesehenen Instrumenten waren in schlechten Zustand geraten, und viel Kriegsschaden war unbehoben geblieben. Noch ein Umstand, der zu der Isolation der Orgel beitrug, war ihre Unfähigkeit stilistischen Entwicklungen so schnell, wie sie in der Hauptströmung der musikalischen Tätigkeit entstanden, zu folgen. Bis die Kreativität der industriellen Revolution im frühen neunzehnten Jahrhundert die mechanischen Mittel zur Verfügung stellte, blieb die Orgel unempfänglich für die Anforderungen einer flexiblen Dynamik und einer schnell verschmelzenden Farbskala. Dennoch komponierte Mendelssohn weiterhin für die Orgel und die bedeutendsten dieser frühen Kompositionen sind ein sanftes Andante (9. Mai 1823), völlig typisch in seiner Art, und drei Monate später die Variationen über einen Choral aus Fischers Buch. Aber es war der erste von schließlich zehn Besuchen in England (im Jahre 1829), der eine Anzahl von Elementen vereinigte, die einen andauernden Einfluß auf Mendelssohns Entwicklung als Organist und als Komponist für das Instrument haben sollten. Kurz nachdem er selbst zu einem früheren Zeit­punkt des Jahres die Matthäuspassion wiederaufgeführt hatte, fand er in London eine aktive Bach-Lobby mit Samuel Wesley an der Spitze und eine ebenso aktive einheimische Schule des Orgelspiels und der Komposition für die Orgel, die von einem lebendigen Einsatz des Kontrapunkts bereichert wurden, welcher seinerseits durch Englands Stilisolation und den anhaltenden Einfluß von Händel gefördert wurde. In Wesleys umfangreichen Voluntaries in mehreren Sätzen, oft völlig gegensätzlich in ihrer Stimmung, können wir die formalen Keime der Sonaten Opus 65 von Mendelssohn sehen. Mit Sicherheit kannte er wenigstens eins davon, und zwar dasjenige das Wesley im Jahre 1829 Thomas Attwood, einem Schüler Mozarts, der Komponist an der Chapel Royal und, von 1796 an, Organist an der St. Pauls Kathedrale war, gewidmet hatte. Es war im Hause Attwoods in Norwood, wo Mendelssohn sich über zwei Monate aufhielt und wo er sich von einem Kutschenunfall im September 1829 erholte. Ihre Freundschaft verband sie bis zu Attwoods Tod neun Jahr später. Der Unfall hinderte Mendelssohn auch daran, der Hochzeit seiner Schwester Fanny in Berlin am 3. Oktober beizuwohnen. Er schrieb ihr jedoch ein Orgelstück, von dem wir später mehr hören werden. Kaum sechs Monate nach seiner Rückkehr nach Hause im Dezember machte er sich, auf Goethes Anregung hin, wieder auf—nach Italien. Die Briefe von dieser Reise sind besonders aufschlußreich mit Hinsicht auf vokale sowie instrumentale Aufführungspraxis und, trotz Mendelssohns scharfer Kritik über die geschmacklose Kost, die von den italienischen Organisten serviert wurde, schrieb er in Rom am 8. März 1831 ein Nachspiel (oder Präludium und Fuge) in D, das Ideen enthielt, die er später wieder anwandte. Auf seiner Rückreise durch die Schweiz in diesem August notierte er in Engelberg: „Ich spielte heute Nachmittag zwei meiner neuen Stücke auf der Orgel in der Kirche und sie hörten sich ziemlich gut an.“ In einem wichtigen Brief (24. August 1831) beschreibt er seine Begleitung einer Messe und eine Improvisation des Credos: „Eine Fantasie über dieses war gut gelungen; zum ersten Mal wollte ich gerne so etwas aufschreiben.“ Er beschreibt den Verlauf des Stückes genau: „… und dann in langen Noten mit den anhaltenden Arpeggien hob ich das Thema auf dem Pedal hervor, so daß es auf A endete. Über diesen gehaltenen Orgelpunkt spielte ich noch mehr Arpeggien, auch nur mit der linken Hand um das Thema des Credos mit der rechten Hand darüber anzufangen.“ Sein Manuskriptbeispiel bestätigt, daß die brillante Struktur, die er vierzehn Jahre später anwandte, am Ende der Chorvariationen, die die Einleitung der d-Moll Sonate Op. 65 Nr. 6 bilden, hier im Keim anwesend sind. Mendelssohn begann jetzt eine Periode intensiver kontra­punktischer Kreativität, die in der Veröffentlichung der Sechs Präludien und Fugen Op. 35 für Klavier (einschließlich einer Revision des D-Dur Duetts für Attwood) und der drei Präludien und Fugen Op. 37 für Orgel, die Attwood gewidmet waren und von Novello sowie Breitkopf & Härtel im Frühjahr 1837 herausgegeben wurden, ihren Höhepunkt erreichte. Ende des Jahres 1836 überarbeitete Mendelssohn die c-Moll Fuge und schrieb am 1. Dezember eine neue in G, in der gewisse technische Einzelheiten aus dem römischen Nachspiel wieder auftreten, zum Beispiel die Einleitung auf dem Pedal, die langen dominierenden Tonika-Orgelpunkte. Zwischen dem 2. und 6. April 1837 schrieb er die drei Präludien und überarbeitete Novellos d-Moll Fuge von 1833, um die Serie zu vervollständigen. Ihre meisterhafte Vereinigung von alten und neuen Stilen hatte einen immensen Einfluß auf die Entwicklung der Orgelmusik des neunzehnten Jahrhunderts. Im ersten Präludium ist die kontrapunktisch aktive Passage, die in romantische Harmonie gekleidet in vielen frühen Werken zu finden ist (die schöne, aber wenig bekannte Trompeten Overtüre zum Beispiel), für die Orgel umgearbeitet, das zweite führt die reiche Lyrik der ersten Fuge fort—ein Stil, der in späterer englischer Orgelmusik viel nachgeahmt werden sollte, während das dritte Präludium Passagen von klavieristischer Virtuosität gegen einen sich wiederholenden Fugenabschnitt setzt … ein Einfall, der in den Orgelsonaten Op. 65 entwickelt werden sollte. Im September 1837 dirigierte Mendelssohn das Oratorium Paulus in der Birmingham Town Hall, wo er auch das Präludium und die Fuge in Es-Dur von Bach spielte. Er spielte wieder in der St. Pauls Kathedrale, und zwei Tage danach spielte er „sechs extemporierte Fantasien“ sowie Bachs große a-Moll Fuge auf der neuen Orgel in der Christ Church, Newgate Street: „Sein extemporiertes Spielen ist sehr verschiedenartig—die sanften Sätze voller Zartheit und Ausdruckskraft, äußerst schön und leidenschaftlich—und doch so regelmäßig und methodisch, daß sie wie das Ergebnis langer Überlegung und tiefen Nachdenkens erscheinen … Seine lauten Präludien enthalten eine endlose Vielfalt von neuen Ideen, völlig anders, als diejenigen, die gewöhnlich in Mode sind; und die Pedalpassagen so neu und selbständig, so feierlich und eindrucksvoll, so erhaben und würdevoll, daß es den Hörer in Erstaunen versetzt.“ Er spielte bei jedem seiner Besuche 1840 und 1842 wieder, und am 25. Juli 1844 schrieb er an seine Schwester: „… such’ nach dem Orgelstück in A-Dur, welches ich für Deine Hochzeit komponierte … ich habe einem englischen Herausgeber [Coventry & Hollier] ein ganzes Buch von Orgelstücken versprochen, und als ich sie eins nach dem anderen aufschrieb, ist mir das alte plötzlich eingefallen. Ich liebe den Anfang aber ich hasse die Mitte und ich schreibe es ganz neu mit einer anderen Choralfuge über Aus tiefer Noth.“ Fannys Manuskript kam nicht, so vollendete er das Stück, welches der erste Satz von Op. 65 Nr. 3 werden sollte, aus dem Gedächtnis. Im Urlaub in Soden, in der Nähe von Frankfurt (1844), schrieb Mendelssohn zwischen dem 21. Juli und dem 18. August sieben Orgelstücke. Er dirigierte dann die Zweibrücken Festspiele und informierte Coventry am 29. August daß er „mit den Orgelstücken sehr beschäftigt war … und sie sind fast fertig. Ich möchte sie gerne Drei Sonaten nennen … anstatt Voluntaries“. Er nahm am 9. und 10. September die Arbeit mit drei weiteren Stücken und der Überarbeitung einer f-Moll Fuge (die er 1839 mit noch zwei anderen geschrieben hatte) wieder auf, und—erstaunlicherweise—sahen die nächsten sechs Tage die Vollendung des e-Moll Violinkonzerts. Zu diesem Zeitpunkt hatte Mendelssohn offensichtlich drei Orgelsonaten in F, D, und A ins Auge gefaßt, aber andere Verpflichtungen unterbrachen seine Arbeit bis zum 19. Dezember. Bis zum 2. Januar hatte er das Projekt mit der Komposition von noch zwei Serien von Stücken, in b-Moll und C, erweitert, obwohl keine der bis jetzt fünf Sonaten ihre endgültige Fassung erreicht hatten. Am 26/7. Januar 1845 komponierte er alles das, was die Sonate Nr. 6 in d-Moll werden sollte und machte sich daran den Rest des Materials sorgfältig auszusortieren und zu überarbeiten. Die f-Moll Sonate Nr. 1 (ursprünglich waren Nr. 1 und Nr. 3 in umgekehrter Reihenfolge) beginnt mit einem der stärksten Sätze in der ganzen Gruppe, in der der Choral Was mein Gott will gescheh’ allzeit in völligem Kontrast zu einem überwiegend fugierten Satz steht. Nach einem lyrischen Lied ohne Worte lebt der Kontrast, dieses Mal zwischen stillen Fragen im Rezitativ und kräftigen Antworten der Orgel, vor der Schlußtoccata wieder auf. Mendelssohn verwarf die f-Moll Fuge von 1839 schließlich und auch das Andante in F-Dur, ein sanftes Trio, welches sich hier getrennt befindet. Nur die einleitenden zwei Sätze der Sonate Nr. 2 waren neu (das Adagio hat eine besonders feine Textur); die dritte ist eine Neubearbeitung der Einleitung des Nachspiels von 1831 und die letzte ist eine Revision einer anderen der Fugen von 1839. Von den zwei weiteren nicht angewandten C-Dur Sätzen befindet sich das marschähnliche Allegro maestoso hier getrennt. Um die dritte Sonate in A zu vollenden, fügte Mendelssohn nur einen kurzen, nachdenklich melodischen Satz am Ende des überarbeiteten Hochzeitsstücks von 1829 hinzu. Die Sonate Nr. 4 in B verursachte dem Komponisten viel Schwierigkeiten, das umfassende Präludium und das Andante (das letztere ursprünglich ein Marsch) wurden beide neu geschrieben; das schwungvolle und melodische Allegro in B wurde zuerst komponiert, aber dann zugunsten einer Fuge, über ein dem jetzigen Finale ähnlichen Thema, abgelehnt. Diese selbst wurde überarbeitet (um das Thema dem Pedal idiomatisch passender zu machen) und zwischen der Einleitung aus Akkorden und der Koda eingeschlossen. Gleichzeitig wurde das fließende Allegretto hinzugefügt. Von den verschiedenen Sätzen in D-Dur und d-Moll aus denen Mendelssohn die Sonaten Nr. 5 und Nr. 6 hätte zusammenstellen können, verwarf er zwei, die hier aufgenommen sind. In dem Andante mit Variationen in D folgen vier ausgeglichene und charmante Variationen einem schlichten Thema—ein völliger Kontrast zu der Macht des Allegros, Chorals und Fuge, die er zwei Tage später schrieb. Die Sonate Nr. 5 hatte ursprünglich eine Variante des einleitenden Chorals (wahrscheinlich Mendelssohns eigene, aber dem Dir, dir Jehovah, will ich singen ähnlich) vor dem Finale (damals als Sechzehntelnoten anstatt von Triolen dargestellt und mit vielem Wechseln der Manuale), während der flotte zweite Satz in d-Moll war (anstatt H). Wie bei Mendelssohn sonst selten, ist es diskutabel, welche Fassung die bessere ist. Die Sonate Nr. 6 ist von dem Choral Vater unser im Himmelreich durchdrungen; sie beginnt mit vier immer brillanter werdenden Variationen desselben; die darauf folgende Fuge nimmt die einleitende Phrase zu ihrem Subjekt, und in dem Abschiedsfinale ist die letzte Phrase im Pedal zu finden. Die Sonaten wurden am 15. September 1845 herausgegeben und, obwohl Mendelssohn sie nur im privaten Kreis vortrug, war er bei dem öffentlichen Erfolg der Sonate Nr. 3 1847 in London zugegen. Er selbst, zerrüttet einerseits von der Strapaze der Komposition, der Vorführung und der Überarbeitung des Oratoriums Elias und andererseits dem Tode seiner Schwester, spielte die Orgel in diesem Sommer zum letzten Mal in Ringenberg in der Nähe von Interlaken, wo er ein Präludium und eine Fuge in c-Moll improvisierte. Er starb im folgenden November im Alter von 38 Jahren.